Tips for Good Posture…No Your Mother was Not Wrong in Correcting You. | Delta Physical Therapy Experts|Tips for Good Posture…No Your Mother was Not Wrong in Correcting You. I recently saw a news piece on the topic of good and bad posture and the effects that it can have on our health. The interesting thing was, it was not led by the American Physical Therapy Association (APTA). 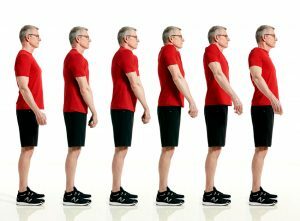 Our role as PTs is to “Transform society by optimizing movement to improve the human experience.” As PTs we see a variety of different aches and pains every day and there is something that a large majority of those aches and pains have in common, bad posture. So lets talk about posture. Many things can affect our bad posture. Our work set up whether we work in an office, work on an assembly line or work in tight spaces, there are things we can modify to decrease the strain on our bodies. Our hobbies and downtime on our phones can also affect our posture and increase pain in our necks and back. 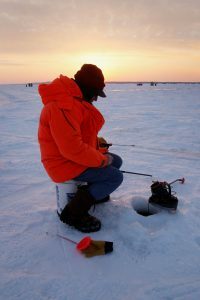 An example of a hobby affecting your back pain is going ice fishing and sitting in your chair or leaning over your ice hole all day long catching fish. It can be a great time but leave you with a sore neck and back. I’m sure many of you can relate. 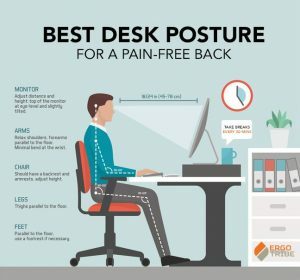 Here are some tips to improve your posture and decrease your pain, or prevent your pain in the future. Start by placing your monitor at eye level. This will allow your neck to be in a neutral position and will avoid having to look up or down at the monitor which would cause muscle imbalances to occur at the neck. Next, get a chair that provides good lumbar support to your low back in order to avoid slouched posture. Follow that by having your keyboard and mouse low enough to your lap so your elbows are at a 90-degree angle and your wrists are in a neutral position. Sitting with your feet flat on the ground with your knees and hips at a 90-degree angle will also help. If you are on the phone frequently during the day at your desk, make sure your phone has an extension piece on the backside so you are not leaning your neck towards your shoulder to talk and type at the same time. Another resolution to this problem would be getting a head set where you can listen and speak into the headset while you are on the phone. If you have access to a desk that allows you to stand or sit, try to increase the amount of you stand each day so that you are sitting and standing equal amounts of time. Remember to keep monitor at eye level and elbows and wrists in a neutral position when you are standing at your desk. Placing a rubber or foam mat under your desk when standing can also alleviate the stress on your feet when standing for prolonged periods of time. Remember when you are standing to keep your work close to you and try to not slouch or overextend yourself, but stay in an upright posture. If you do not have access to a standing desk then try to plan a short walk around the office for every hour you are sitting. 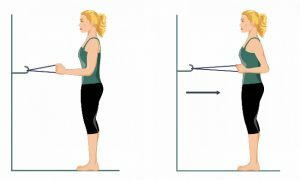 This may not always be possible but even standing for a few minutes and performing back extensions, rolling your shoulders or marching in place will help. Remember, the most important thing you can do is to keep your work close to you. If you are required to lift heavy objects from floor be sure to keep lower back in neutral position while bending knees and flexing hips to help lift objects. 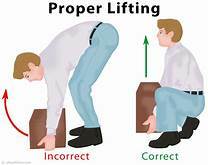 When lifting objects at waist level, keep objects close to you with upright posture, your legs can also help. If you are required to lift and twist to place object, keep legs flexed and take extra steps, if you can, with your feet instead of over rotating at your low back. In the end, if something is starting to hurt from doing a certain task, try to modify it or decrease the amount of times you have to do that certain task. Rolling shoulders – start with upright posture and move shoulder forward and backwards in a circle. 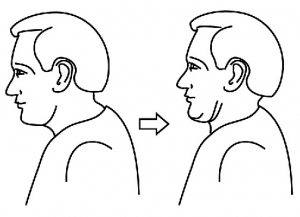 Chin tucks – can be performed lying down on your back or standing up with good upright posture. Pull the chin back and give yourself one of those great double chins. Hold for about 30 seconds. You should feel a stretch on the back on your neck. 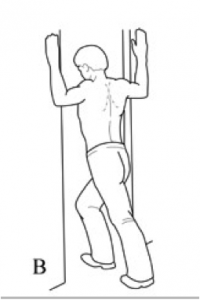 Door frame stretch – can be performed with one arm and both arms in a doorframe and you leaning forward to feel a stretch along your pecs and front of your shoulders. 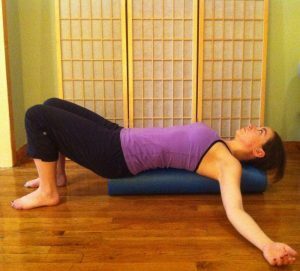 Foam Roll Shoulder Stretch – similar to doorframe stretch but performed on your back lying down. Should feel the stretch along your pecs and front of your shoulders. Rows – we cannot forget some strengthening of your mid back. This can be performed with or without resistance bands. Stand in good upright posture and bring shoulders and elbows back with a good squeeze between your scapulae (shoulder blades). Remember, much of the pain you feel in your back and neck, may be coming from bad posture. If you have any questions please feel free to contact us and we can see how we can help!